Do you know that smell right before it rains? It's not the rain itself, but the smell of the impending wetness mixing with the dry dirt. 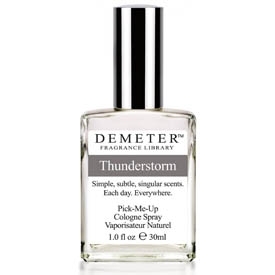 This is what this Thunderstorm Cologne smells like! In Arizona, we call the summer months the monsoon season because it is when we see the most thunderstorms. It fills our skies with beautiful clouds and breathtaking sunsets. If we could rename this fragrance, we would call it monsoon in a bottle!